Hello and welcome to another post! Here at HireBrid we like to make sure that our drivers are always fully prepared and ready for any changes that might affect them or just to keep them up to date with all the latest goings on in the PCO/Transport market. Our latest post is going to discuss the much talked about topic of ULEZ – Ultra Low Emission Zone. What is the ULEZ and how will PCO car hire drivers be affected? 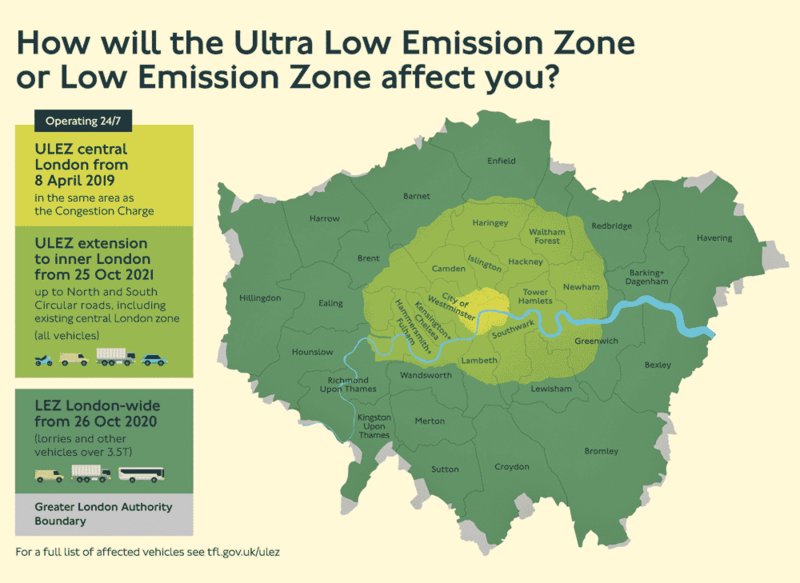 The Ultra Low Emission Zone or ULEZ is the new zone within London which has been brought in by the Mayor of London Sadiq Khan. It is being used as a tool to try and reduce the pollution in the capital. This is in response to the fact that London reached their yearly pollution limit within less than a month into the year and will be going live on 8th APRIL 2019! According to the TFL website the introduction of the ULEZ will help to reduce NOx and PM emissions. This is turn will help to improve the air quality leading to healthier skies and cleaner air for us all to breathe in! Requirements & when ULEZ operates. We at Hirebrid are pleased to let you know that ALL of our cars are compliant and hence there is no charge for our drivers to pay, however, changes have been made to the congestion charge and now all PCO drivers will have to pay the daily £11.50 charge. If you are looking for Uber car hire services in London, contact Hirebrid. Are you looking for Uber car hire and PCO car rental services in London? Hirebrid provides Uber approved insured and serviced hybrid vehicles for hire to PCO licence holders. Contact the experts Hirebrid on 020 7722 0020 for more details.